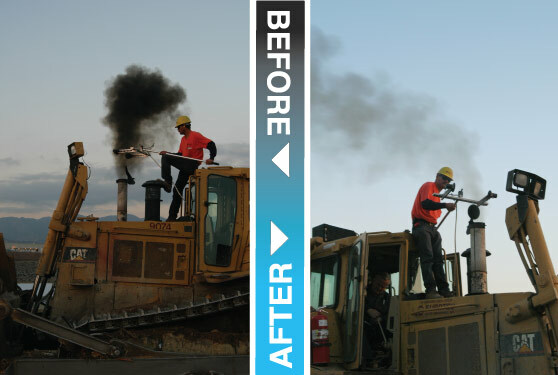 More thorough combustion results in dramatically lower diesel particulate matter (DPM) of which black smoke is the visible component. Opacity reductions of 40% to 70% have been measured as a direct result of the use of UltraBurn®. Significant reductions in carbon monoxide, nitrogen oxides and hydrocarbon levels have also been measured. Actual results from an UltraBurn® customer are demonstrated in this before/after image. The picture on the left is before installation of UltraBurn® Combustion Catalyst System. The picture on the right is after installation.